Corinthian Order: My First Lace Pattern, First Shawl Pattern, AND First MKAL! Corinthian Order is a basic top-down shawl or stole available in triangular, crescent, and rectangular (stole/scarf) shapes. The main body can be lace or stockinette, and can be a different colour than the border. I am going to be a running an MKAL (mystery knit-a-long) for my first published knitted lace pattern, which is also my first published shawl pattern. Corinthian Order is inspired by the Corinthian style columns of classical Greek architecture. Along with the Doric and the Ionian, it is one of the three classical Greek column styles, and the most elaborate. 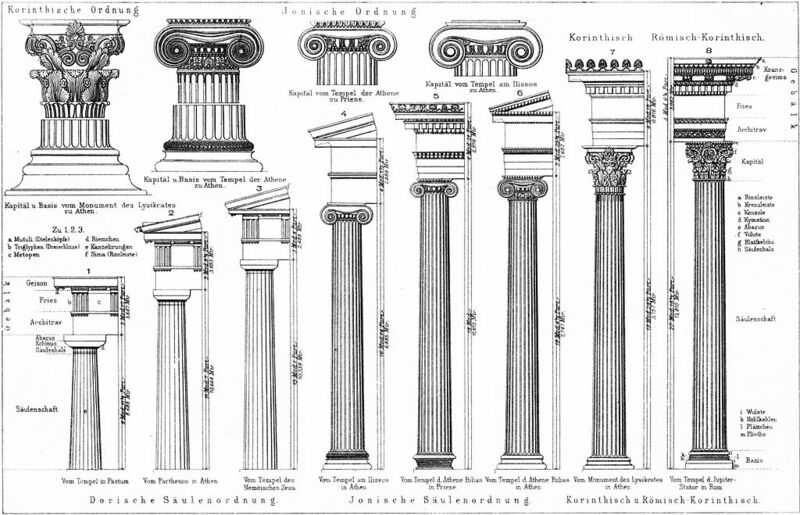 Later Hellenistic styles often combined the simplicity and cleanliness of the Ionic order with the Corinthian to create a Composite order, which is also a choice in the pattern. Pricing (free for the beginning!) and pattern information, including release info, is at the bottom of this blog post. 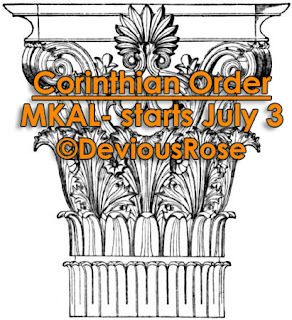 Inspirational image for Corinthian Order. Meyers Kleines Konversationslexikon. Fünfte, umgearbeitete und vermehrte Auflage. Bd. 1. Bibliographisches Institut, Leipzig und Wien 1892. Public domain. August 14, 2015: We have built the temple columns: post all the spoilers you want! Final pattern release with separate pdfs for triangular, crescent, and stole/scarf options, and a master pdf with all the options. now-July 17, 2015: free! (no coupon code, just add to cart). For those without a Ravelry account, use buy now. If you are a Raveler, go to the Ravelry pattern page and add to cart, then checkout. This way the pattern is added to your library and you get all the updates. The pattern actually came about because when working Ashton, I was determined to have the border of Annis along the bottom of the shawl. Problem is, Ashton is a typical top-down triangular shawl, and Annis is a typical bottom-up crescent shawl. I did my best to create a chart exactly like the Annis border, but going in the opposite direction, and didn't like the result it gave when worked. It looked nothing like Annis, and it looked like the leaf lace I had just gotten tired of working after creating a leaf lace cowl, hat, and shawlette. So I redesigned, changed elements, and ascribed different elements importance. The chart and resulting pattern wind up looking very different from Annis, and only if you know that I was inspired by Annis can you see the similarities. That still doesn't say how I decided to make this a whole new shawl. After blocking Ashton, I noticed when holding it up how very like cathedral spires or temple columns the border lace looked. It was too Hellenistic to be a Gothic cathedral, and needed something MORE to be fully classical. And I didn't want the clean, simplistic lines of the Doric and Ionian orders, no. I instantly thought of the Corinthian style of columns. So I changed up the elements of the design again to give strong lines to the spires, added pillars, and designed a whole new piece. A whole new shawl, customizable due to repeat-friendly charts and easy stitches, of which the most complex is a centered double decrease. Straightforward but will keep you on your toes! I don't have a Ravelry forum or group to host this in, but please feel free to comment here or on the pattern page for questions. You can also tag me on Twitter (@DeviousRose_) and use "#devroseMKAL" to share your progress and ask questions. You can do the same on Facebook, and if you want to have your project photo considered for the pattern page, use "devroseMKAL" as a tag on your Ravelry project page so I can look it up when the MKAl is over. Au revoir, and happy yarning! *After a year and a day, on August 15, 2016 (because yay European folklore), the pattern will revert to be being free and remain that way for the foreseeable future.